Kotobukiya's Ikemen series reimagines American comic book characters in the Japanese ikemen (handsome men) style, based on illustrations by famous comic artist Ricken. 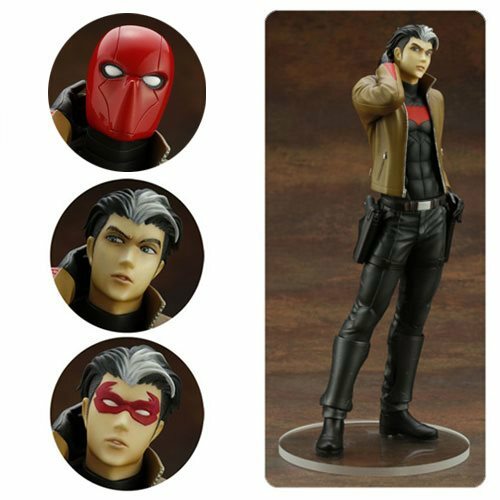 The second entry in this series is this DC Comics Red Hood Ikemen First Edition Statue featuring Batman's second companion, Jason Todd. Red Hood's toned body is expertly sculpted by Naoya Muto, and his jacket and suit are recreated in stunning detail, with the utmost attention to coloring and texture. This figure comes with interchangeable heads so you can display Red Hood with or without his signature full-face mask. Also, the first edition statue comes with a special head part that depicts him wearing his domino mask! Note: The domino mask parts are included only in the first edition of the statue and are not included in any subsequent re-releases.